Our annual Science to Art silent auction is featured during our Annual Dinner and all proceeds benefit STEAM education in the KC region. Submit your image for our 2019 Science to Art auction! Science to Art is a platform for regional scientists to display and describe their research through the visual arts. Each of these remarkable images tells a personal research story and poetically captures the fieldwork performed by the scientists and their teams. These images were submitted by scientists from Columbia, Missouri, to Manhattan, Kansas. All proceeds from the Science to Art auction benefit STEAM education in the community. The stem is composed of footprints from a normal (wildtype) mouse and the flower is composed of footprints from a genetic engineered mouse of which the Snf5 gene has been deleted from its DNA. Mouse with this altered DNA develops a strong neurological phenotype with brain developmental and motor coordination problems. Two colors of nontoxic water-based paint were used to mark the bottom of the forepaws (blue) and hindpaws (red), and the mice were placed onto white paper to trace their footprints and then the colors were inverted. A lifeless insect is first coated with a submicron layer of conductive material, usually gold or carbon. 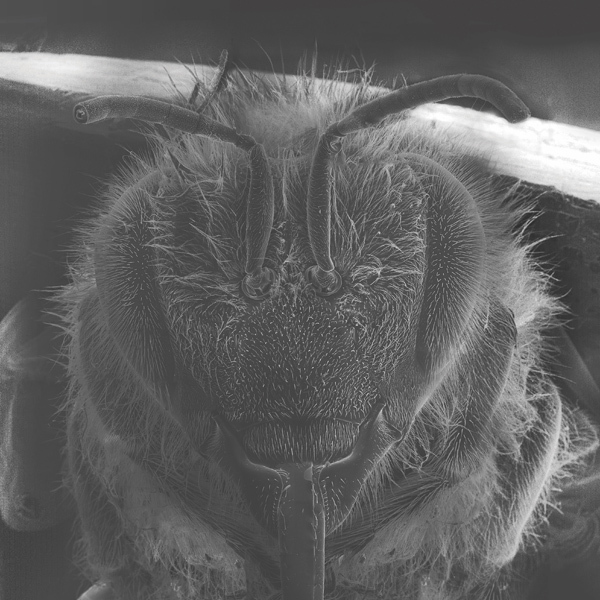 The insect is then placed in the vacuum chamber of the scanning electron microscope, where a focused beam of electrons is scanned over the sample, causing the emission of secondary electrons. These secondary electrons are detected by a sensor, producing a synchronized signal that provides information about the sample surface topology and composition. The signal is converted into an image. The conductive layer prevents the accumulation of space charge around the sample while being scanned and ultimately improves the image resolution. This image shows cells that are used to study Alzheimer’s Disease. 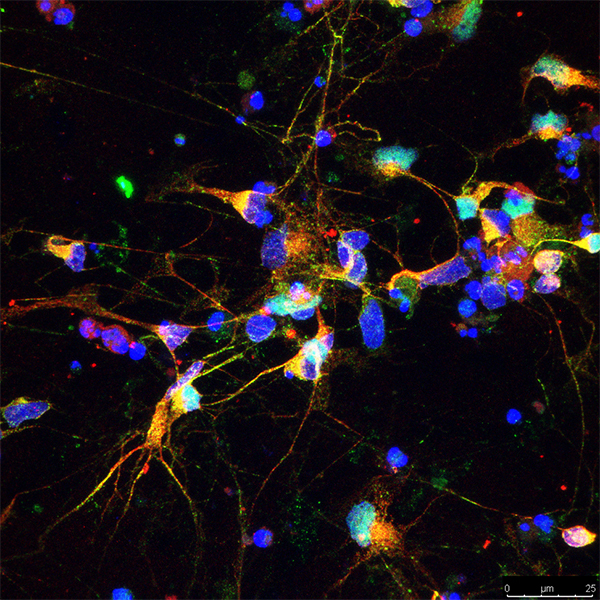 This is specifically cholinergic neurons derived from adult human induced pluripotent stem cells. Green is the choline acetyltransferase protein which shows these are cholinergic neurons. The red is microtubule associated protein 2 (MAP2) marking dendrites of the neurons. Blue indicates the nucleus or DNA. Silvisaurus (“forest lizard”) is a nodosaurid ankylosaur from the Cretaceous. This specimen is remarkable for being the most complete dinosaur found in Kansas. 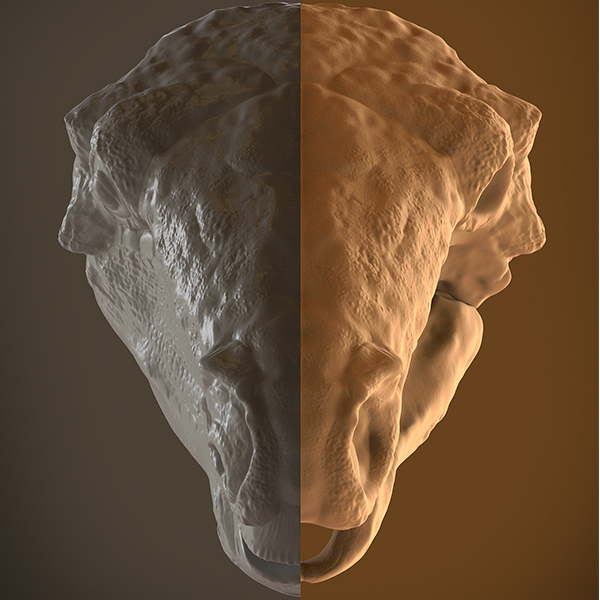 Reconstructions of extinct species are a very powerful tool for communicating science through art. 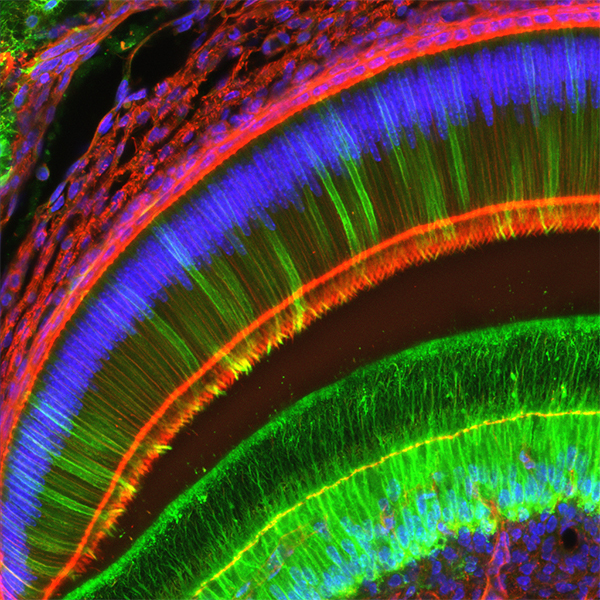 This is a three-color confocal image of an incisor tooth from a young mouse. 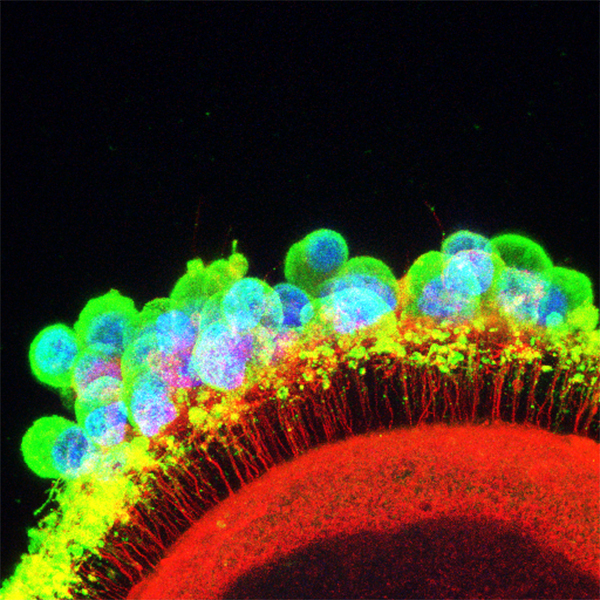 The cells that produce dentin are labeled in green and nuclei are labeled in blue. The red labeling stains the actin cytoskeleton of all the cells. The bright red feature in the middle of the image is actin concentrated at the tips of the cells that produce the enamel of the tooth. These cells extend processes into the enamel that may help organize the enamel crystals. This multi-color confocal imaging is used in conjunction with time lapse microscopy to determine how teeth develop and form the dentin and enamel. 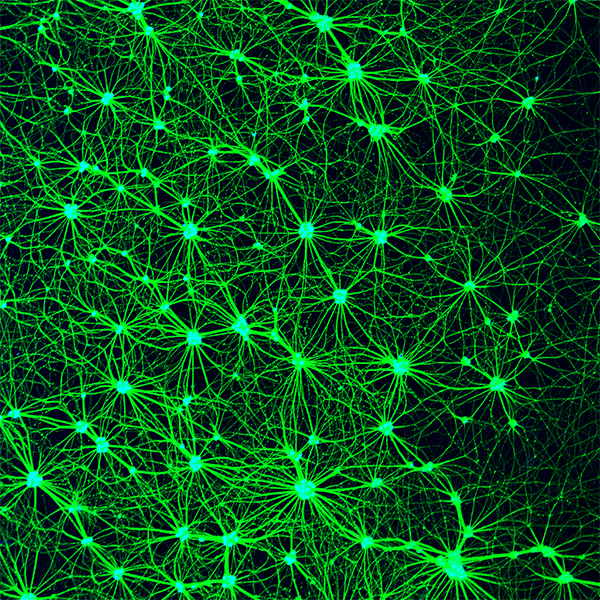 This image is of retinal ganglion cells that form networks when grown in high density on a poly-d-lysine surface. Using different surface coatings that mimic those found in the eye is used to recreate the organization of the retina. This an image of the anthrax toxin. This is the main virulence factor associated with the lethality of anthrax disease, a zoonosis and potential bioterrorism agent. 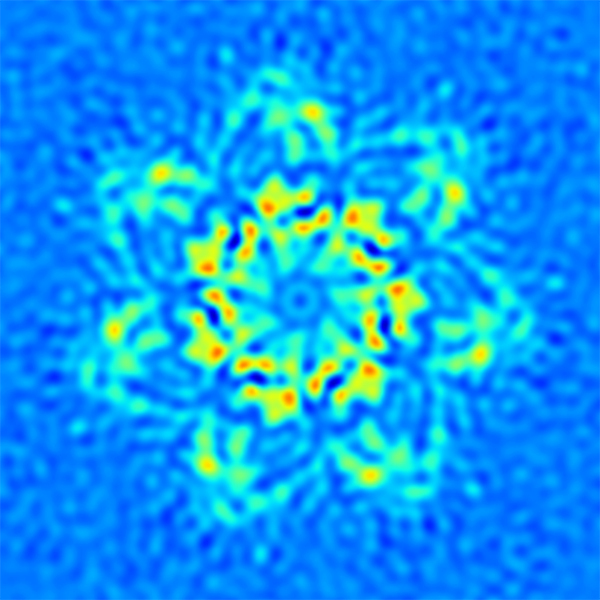 This 2D heat map, from a 3D cryogenic electron microscopy reconstruction, gives atomic details of the anthrax toxin. This pore is only 6 angstroms in diameter. 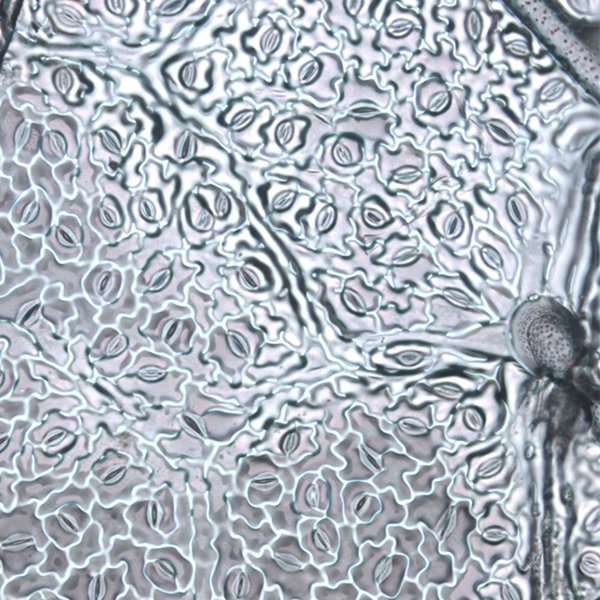 This is an image of soybean leaves taken with the cyanoacrylate “superglue” method. 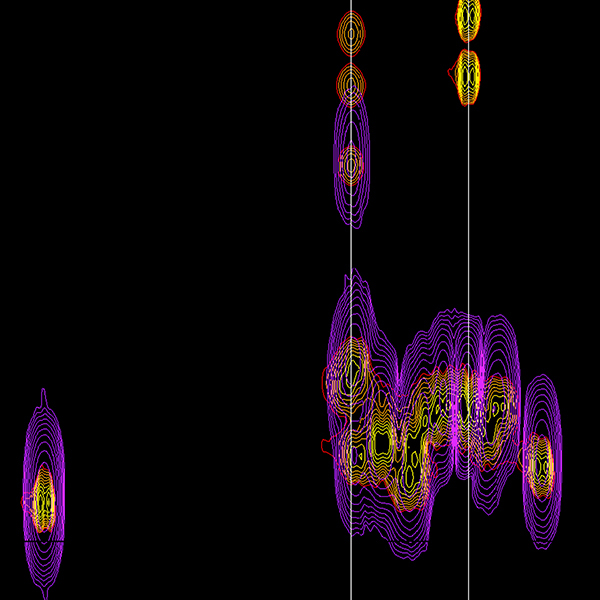 Magnetic Landscape shows the overlay of two 2D-nuclear magnetic resonance data sets which is commonly used for the determination of the secondary and tertiary structures of therapeutic peptides. The peptide studied here (SA-K6L9-AS) shows nanomolar activity against glioblastoma. The green color is the highlights of the muscle side of the neuromuscular junction, while the red color presents the motor neuron axon that make contact with the extraocular muscle at the site of neuromuscular junction. 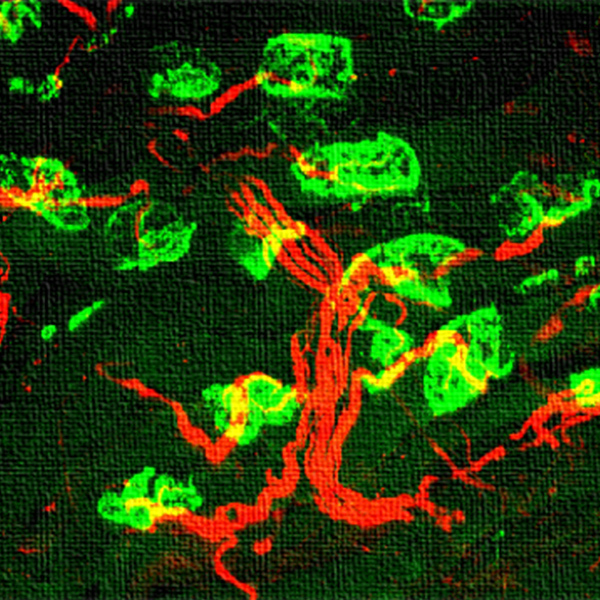 This is a montage of multiple clones of a motor neuron (yellow cell) with its axonal projection (green tube) and accompanying glia cells (red) captured from the spinal cord. The motor neurons are positioned in a radiating arrangement that converge in the center. The image is a bovine oocyte surrounded by supporting cumulus cells. The cells are stained for DNA (blue), the cytoskeleton protein actin (red), and the O-GlcNAcase enzyme (green). 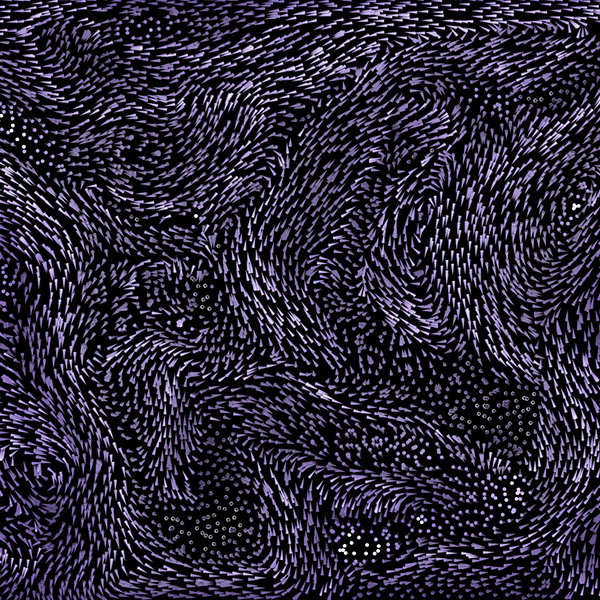 This image depicts the natural complexity inherent in turbulent fluid motion. The arrows in this image illustrate fluid motion within the mixing region of one of the world’s largest breeze tunnels. 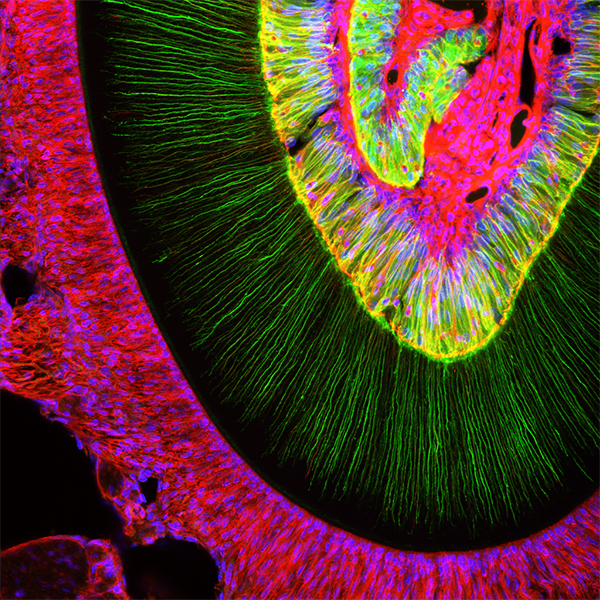 This is a three color confocal image of a mouse incisor tooth in cross section. The cells that produce the dentin of the tooth are labeled in green and extend long processes into the mineralized dentin layer. 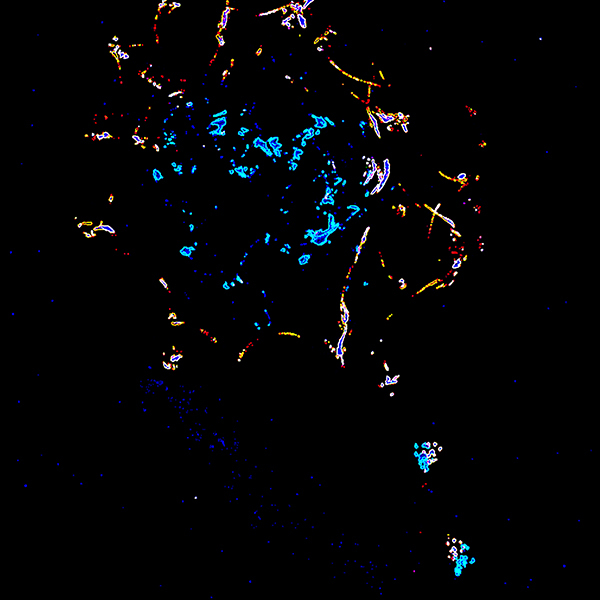 The nuclei of the cells are labeled in blue and the red labeling stains the actin cytoskeleton of all the cells. This is a region of the tooth that does not have enamel covering the dentin. The red tissue below and to the left of the dentin is a specialized ligament called the periodontal ligament that attaches the tooth to the adjacent bone of the jaw. This type of imaging is used together with time lapse imaging to understand the process of tooth development. Multi-photon imaging of capillary networks in a mouse heart using the membrane dye di-8-ANEPPs. 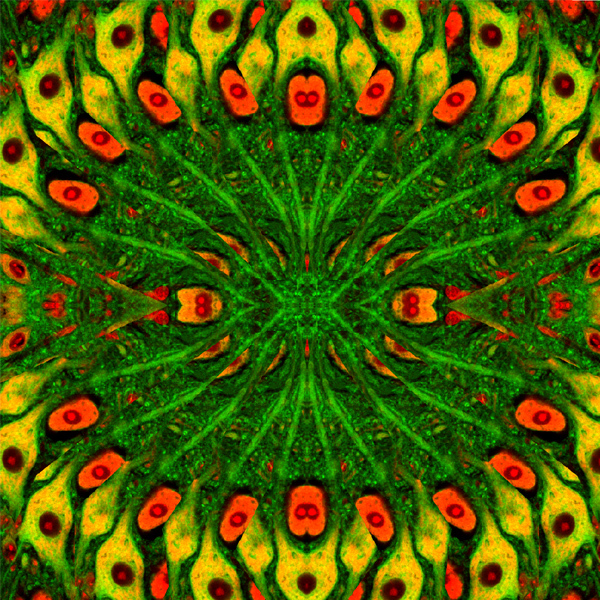 This is a four image piece and is designed to be presented together but with each image separated, which encourages the observer to connect the vascular networks on their own. For every $1 invested, $10.70 has been returned to the region from follow-on funding through our research grants.